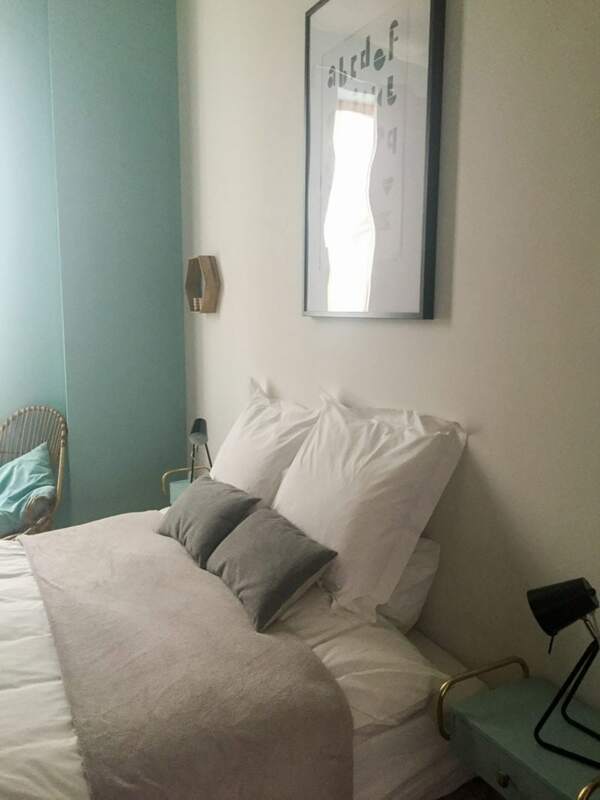 This post is part two of my travel diary from our trip to Europe in May of 2016. 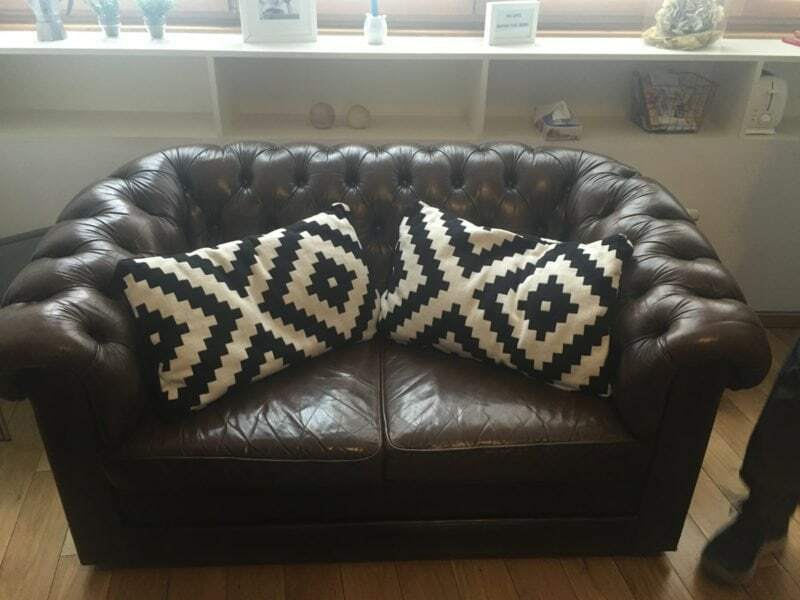 Check out part 1: Amsterdam if you’d like to read about what we did in that city! 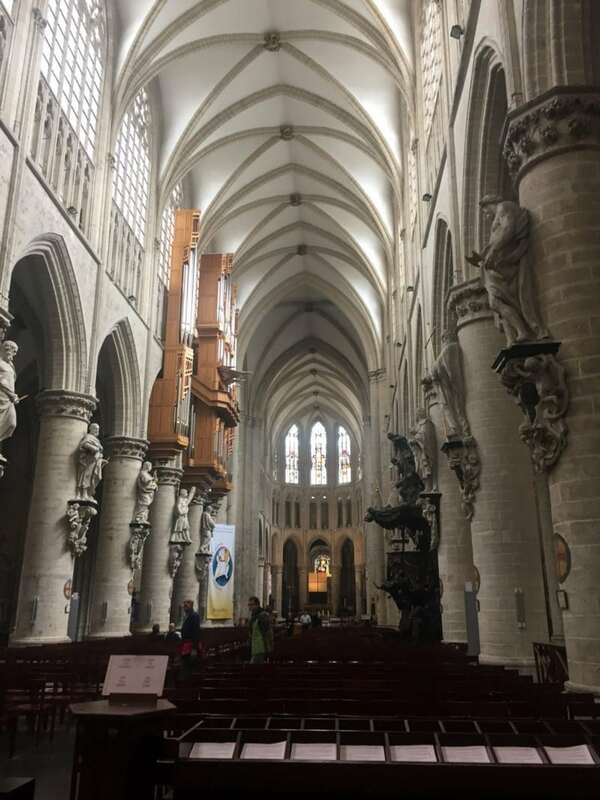 Day 4 and 5 of our ten day trip to Europe was spent in Brussels, Belgium. 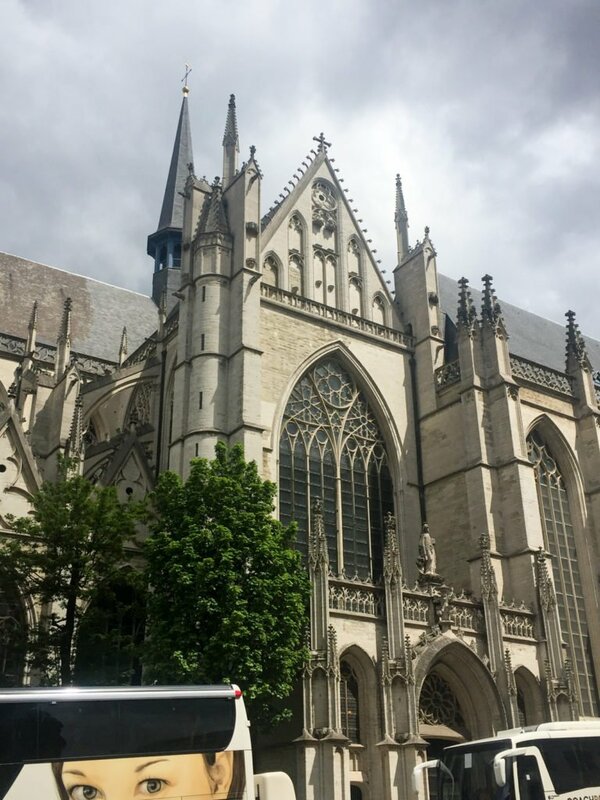 We went here with hopes of sightseeing in the capital of Europe, chocolate tasting, and of course, to try an authentic Belgian waffle! 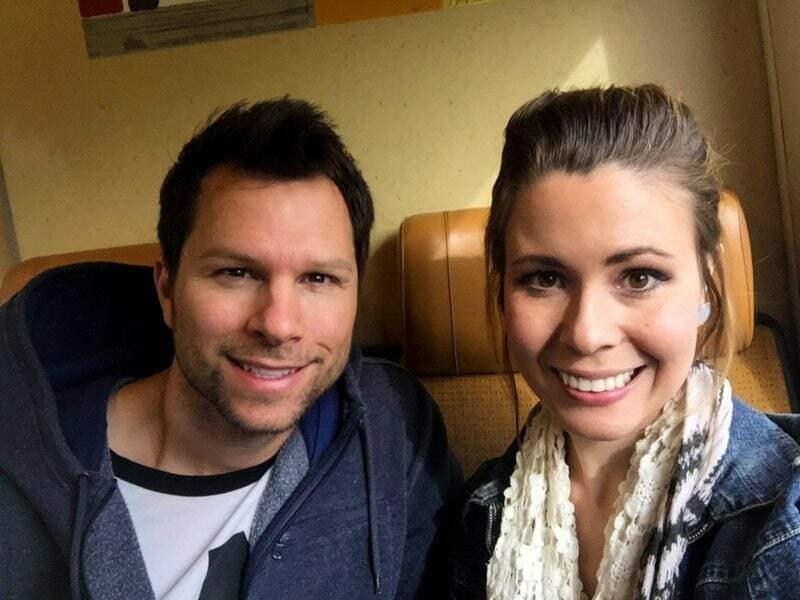 To get from Amsterdam to Brussels, we purchased tickets on the regional train from Amsterdam Central to Brussels. Just an FYI: if you travel on a regional train as opposed to a high-speed train, you do not need reservations ahead of your travel day. These tickets are generally cheaper as well (about € 35,00) but the train ride can be slightly longer (approximately 2.5 hours). 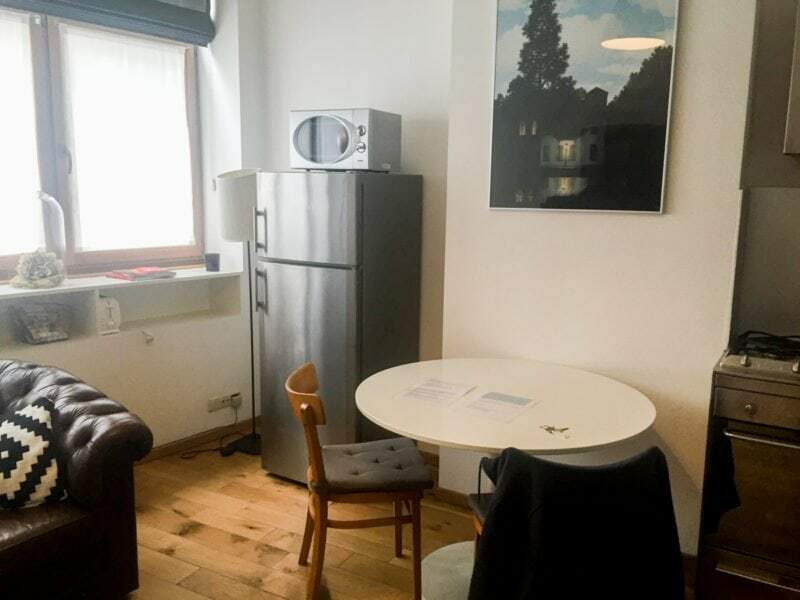 The Accommodations: we had an entire apartment to ourselves that we found on Air BnB less than 0.25 miles from the Grand Place square. This was a very central location and close to everything! 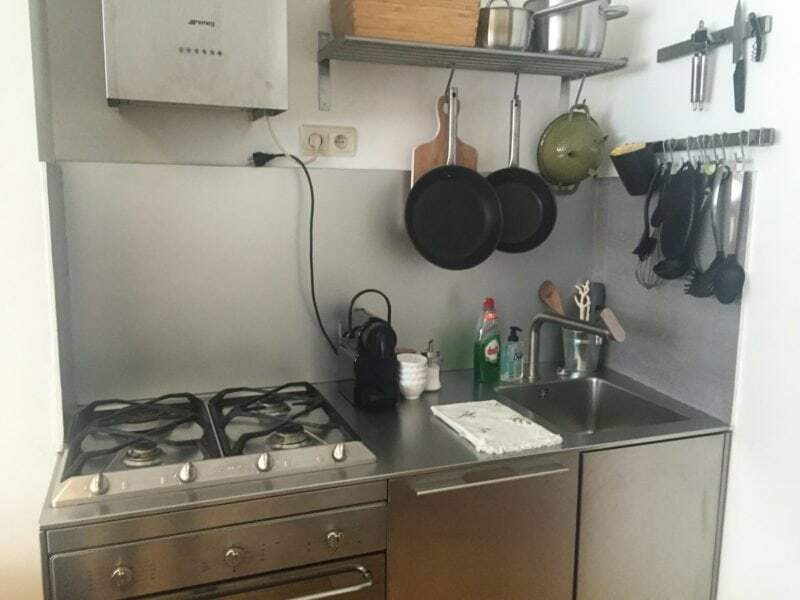 I loved having this whole little place to ourselves – we had the option to cook in the little kitchen, loved having a big bathroom with shower + big bathtub (that’s rare in Europe! ), and felt very “European” walking to and from our “home” for the two nights we were there. Our first night in Brussels was spent having fish and chips at Bia Mara, which is close to the Grand Place square in Brussels. This was a tiny restaurants with fun, industrial decor and a hipster vibe. What I loved about this place was that you could customize your order with options for type of fish, breading style (tempura vs. panko breading), seasonings, and sauce options. They even had chicken and vegetarian options, so there really was something for everyone. Ryan ordered the classic panko breading with house made tartar sauce, and I had the lemon and basil tempura with garlic truffle sauce. The sauce had a little too much truffle oil in it for my taste, so I mostly ended up sharing Ryan’s tartar sauce with him. 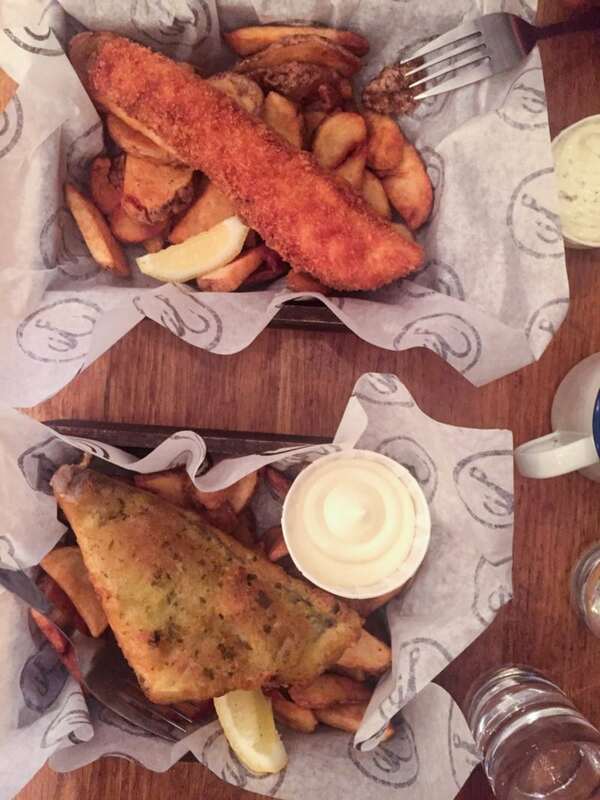 The chips were excellent – super fresh with a crispy exterior and soft, almost creamy interior. Dessert involved a short trek into downtown to Vitalgaufre for a hot waffle. 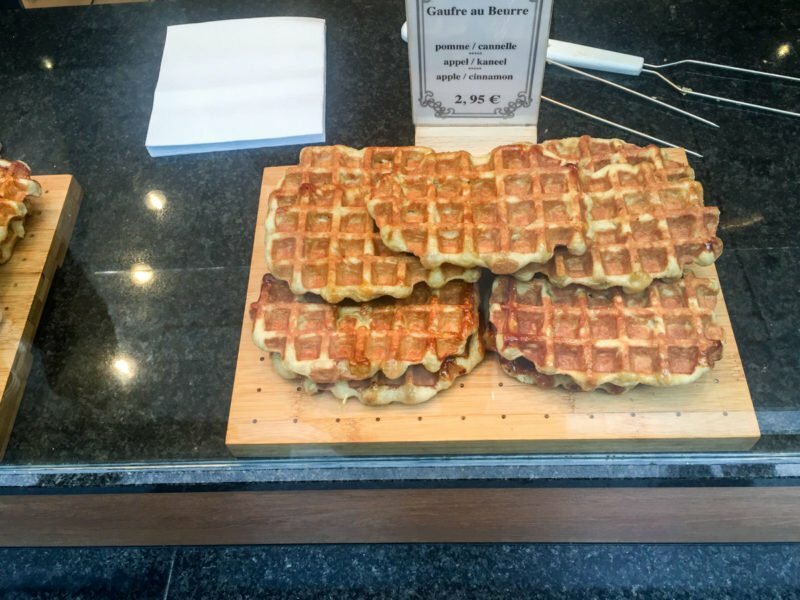 These were Liege-style waffles (the two types in Belgium are Brussels and Liege), which are made with a thick batter that has caramelized sugar crystals on the outside. It’s definitely more of a dessert pastry than a breakfast item like we would have in America! 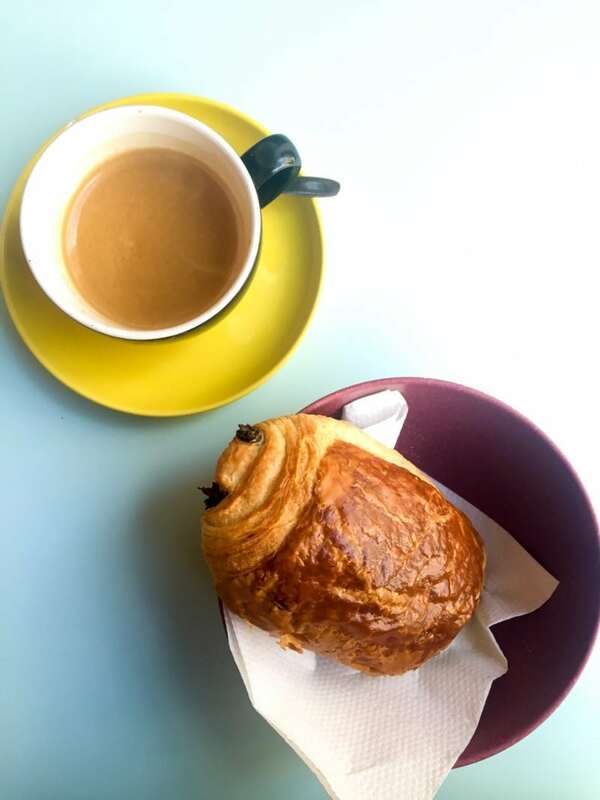 For our first morning in Brussels, we had the best breakfast at Boulangerie Charli. 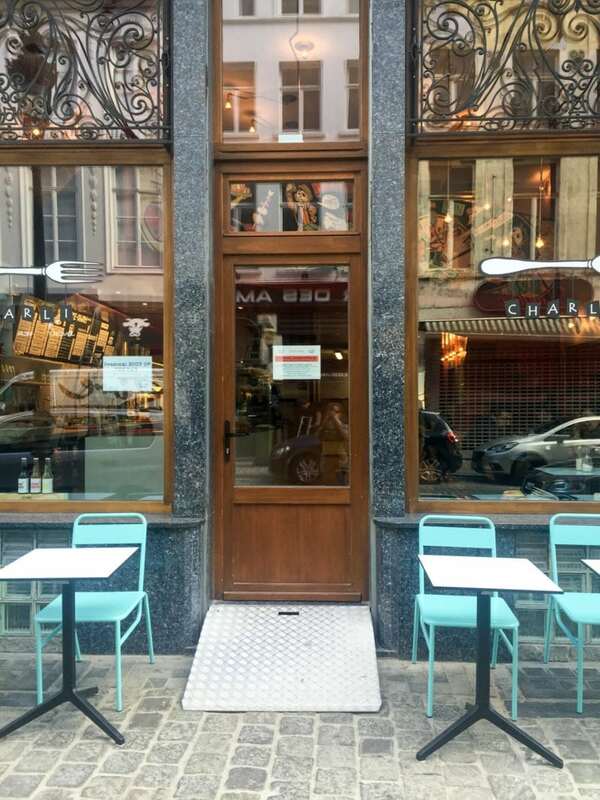 This delightful little pastry shop has a bakery on one side of the street and actual dine-in cafe (pictured) below directly across on the other side of the street. 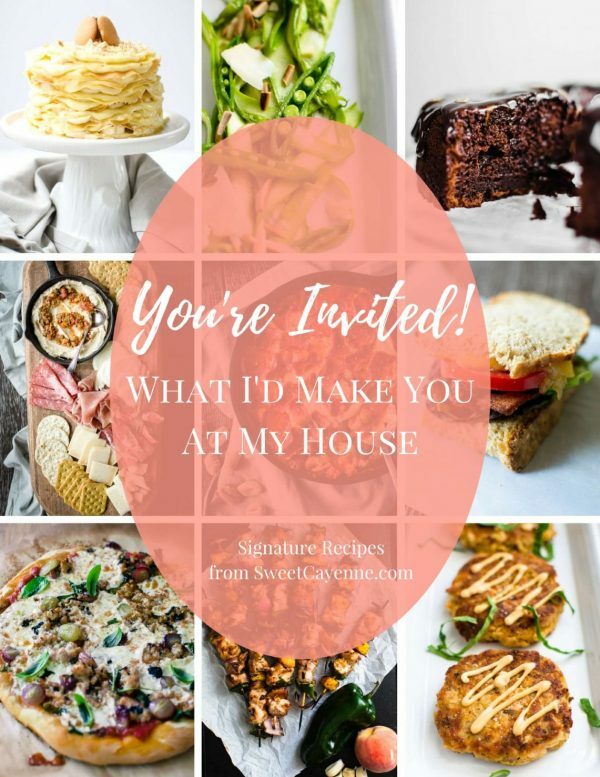 The decor is bright and cheerful, and I was delighted by the see-through flooring at the entry way which allowed you to watch bakers in the basement kitchen roll out long sheets of croissant dough and cut/shape them into moons. For our meal, we split a pan au chocolate and a plate of cheesy scrambled eggs I dare to say are the best I have ever had! 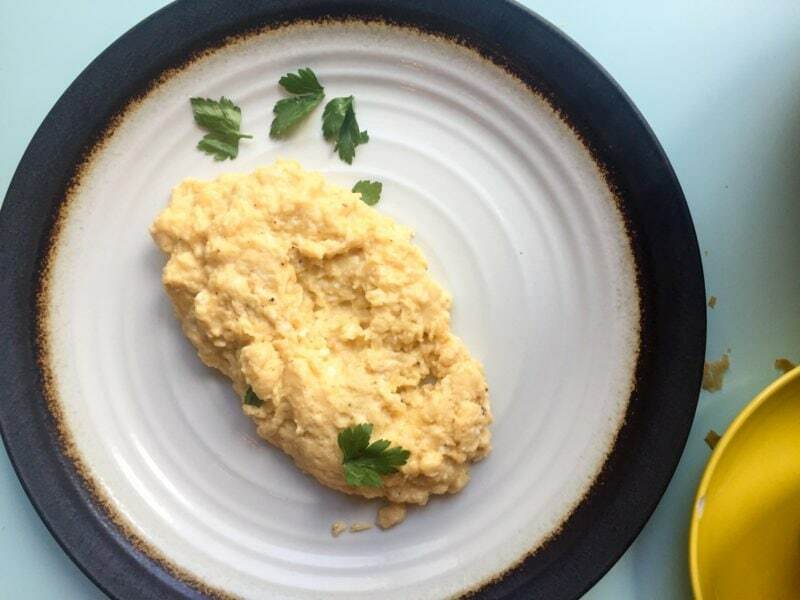 The eggs were soft and cloud-like, and I think there were a mixture of cheeses folded into them because of the salt, sharp and buttery flavors I picked up. The pan au chocolate was perfect to me – not over-baked – with a light crips crust and lots of soft buttery layers inside. I always ordered a cafe Americano at cafes – the traditional European “cafe” or “coffee” is actually an espresso shot, which is a little too strong for my taste. 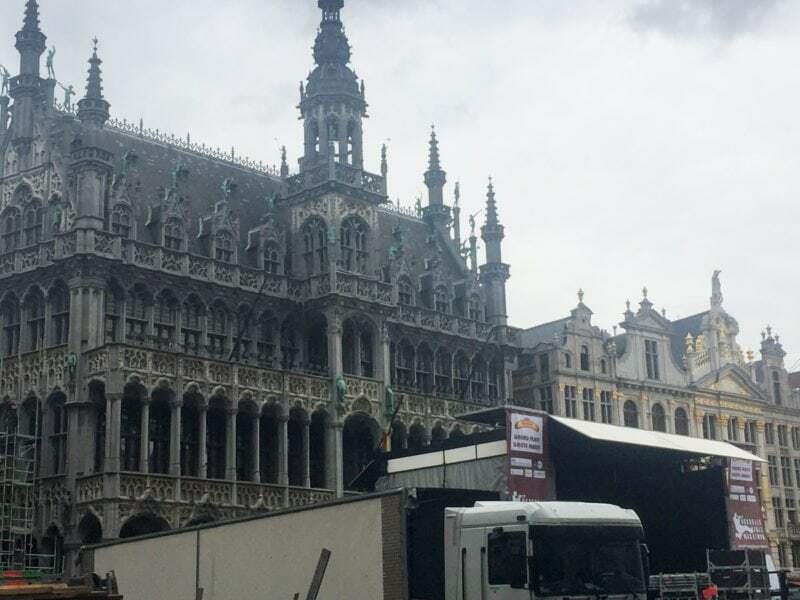 The Grand Place – this is the central square of the city, and is known for it’s opulent architecture. The square is lined with chocolate shops from the countries most famous chocolatiers; like Godiva and Neuhaus. Unfortunately during our visit here, there had been a concert the day before and construction crews were busy taking everything down. It was crowded and hard to get good pictures of the square with everything going on. As far as the chocolate shops go, I found them to be quite overwhelming! Overwhelming in terms of the selection, prices, and overall demeanor of the shop workers. 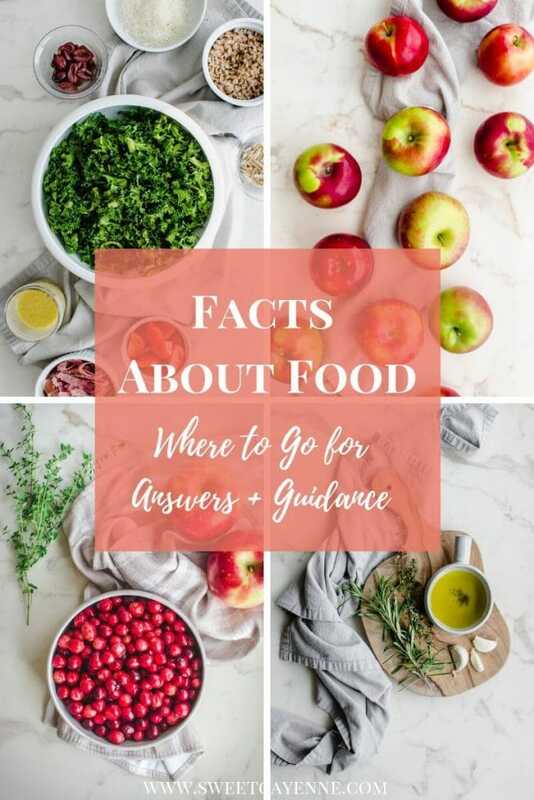 They are very stingy with the samples here – both places we visited only let us have one small sample of only one item, so it was hard to justify spending a lot of money on something you were not sure of how you would like it. We did get a cup of hot chocolate at Neuhaus; and although it was good, I found the texture to be a bit chalky (it was literally just melted chocolate; no cream or sugar added). Pierre Marcolini chocolatier is definitely worth a visit and is recommended by many Belgians (esp, but be prepared to pay a pretty penny for their chocolates! 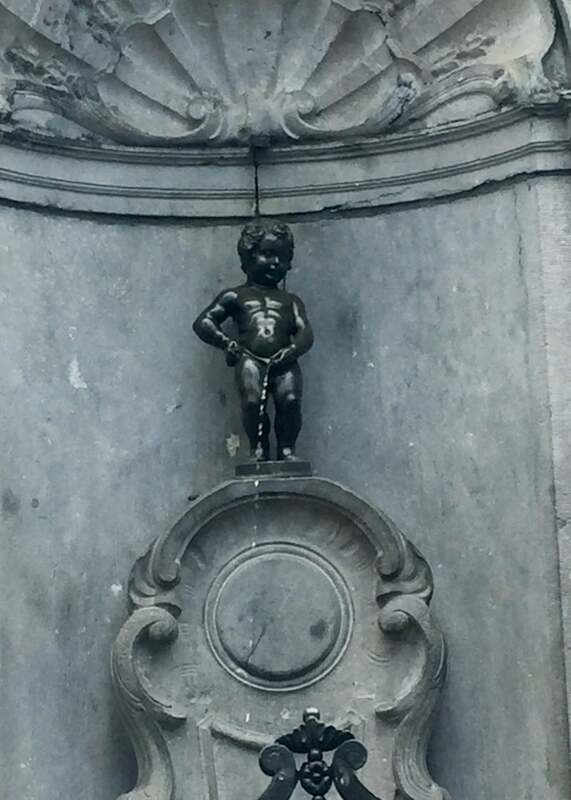 Manneken Pis – this little peeing boy is Brussel’s most famous statue. It’s really a must-see with not much to see – I was amazed at the throng of tourists standing around and gawking at this. What’s funny about this boy being a Brussels icon is that the city, in my opinion, has the smell of urine. 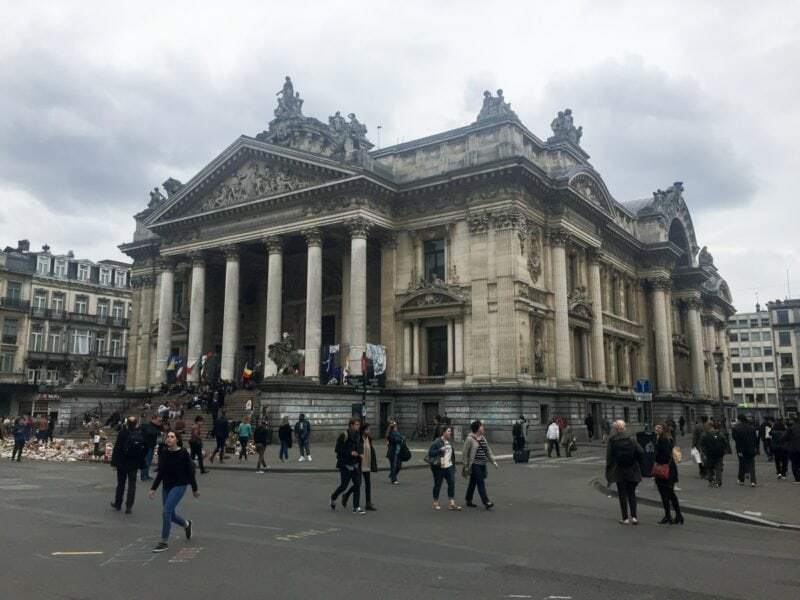 We found Brussels to be very dirty and witnessed men urinating in public on more than one occasion – eww! There are even public/out-in-the-open urinals (nothing like this for women, mind you) near the train station; and I found this to be just a little too much to handle! 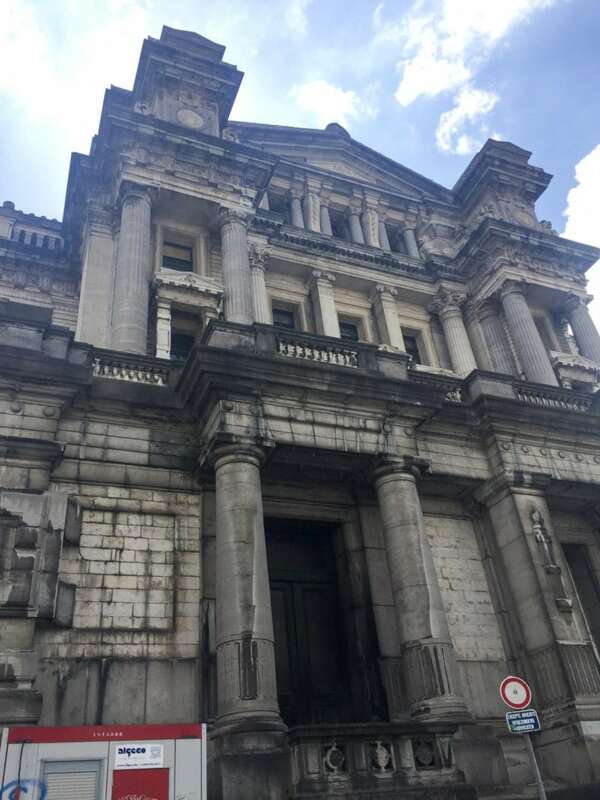 Palais de Justice – the justice hall is definitely a site to see because of it’s size and how old it is. The building almost looks as old as an ancient Roman ruin. 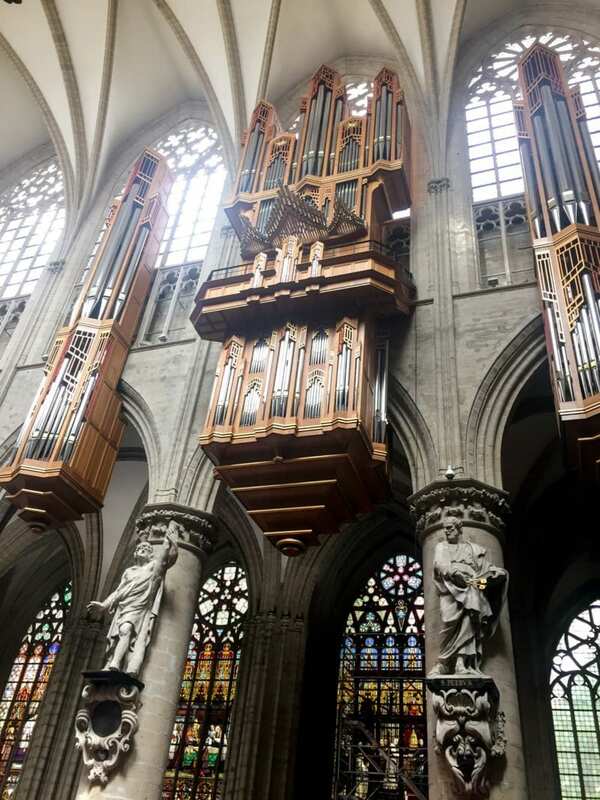 St. Michael’s Cathedral – this breathtaking cathedral is near the university in Brussels and boasts some of the most stunning stained glass windows I’ve ever seen. 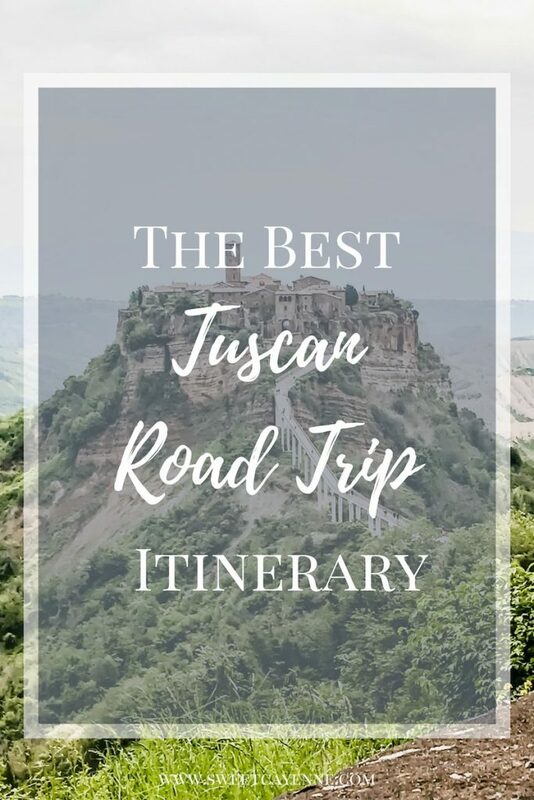 It’s definitely worth a stop; and you can certainly plan to spend an hour or so here exploring the grounds. The pipe organ is outrageously large and quite a site to behold! 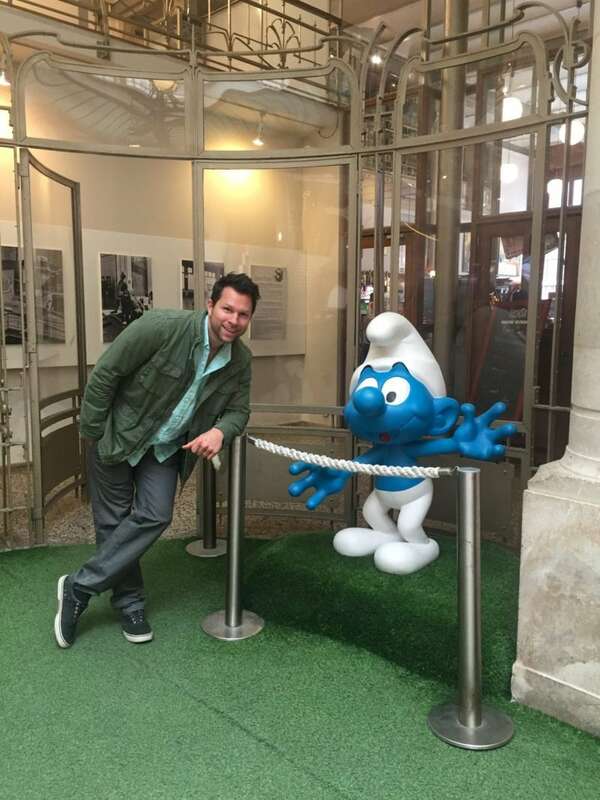 Smurf land – I was surprised to learn on our trip that Brussels is home to many popular comics – the most recognizable for me was the Smurfs! These little guys can be seen in artwork and souvenir shops throughout the city. The picture below was taken at the Belgian Comic Strip museum. Well folks, that’s a wrap! 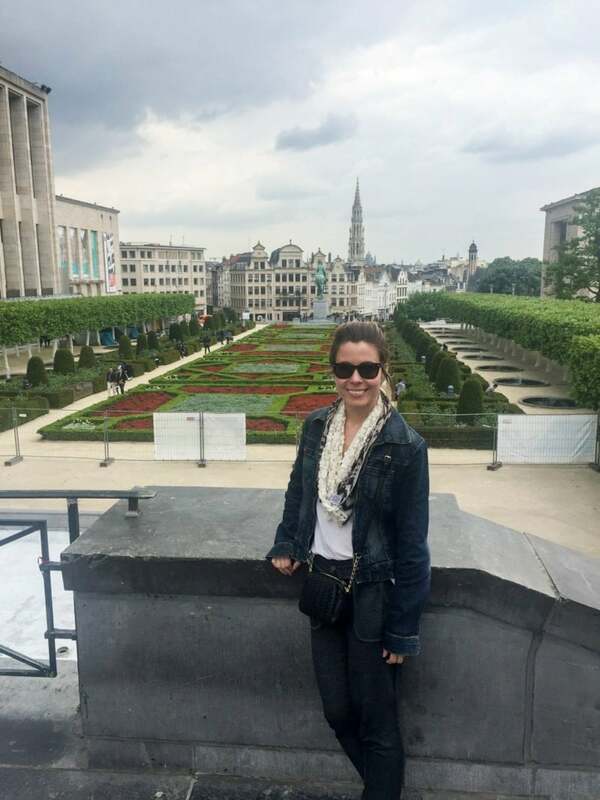 I’d love to hear your travel experiences in Brussels in the comments below; or let me know if you plan on visiting any time soon! 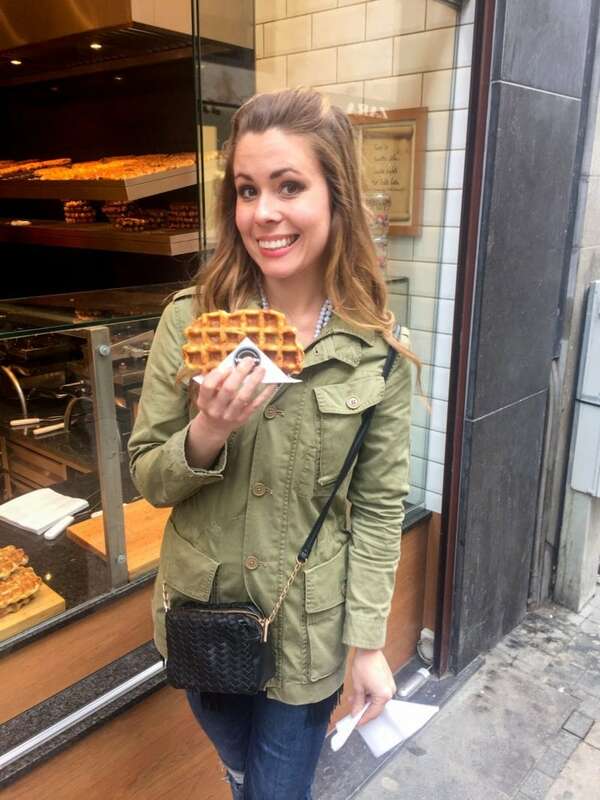 My husband and I went to Brussels last summer and man do I miss those waffles!!! They are the best things ever! Great pics!!! Thanks Kaleigh! Did you like the Brussels or the Liege-style waffles best?